1. Euouae at Old First Concerts: A new a cappella ensemble with an unpronounceable name gave its first concert at Old First Church on Van Ness Avenue on Friday evening. The repertoire consisted of sacred music from medieval France: the Tournai Mass, organum from the Magnus Liber of Leonin, and Obrecht's six voice Salve Regina. What was palpable for me was how much better the music sounded when the conductor, Steven Sven Olbash, wasn't conducting. I couldn't figure out why Olbash chose to direct some pieces but not others. But the flow of the phrases seemed so much more organic when the singers were left to their own devices. They listened to each other more carefully and conveyed a greater sense of the undulating, horizontal movement of the line. The women's chants suffered particularly from being led by Olbash. Wedged awkwardly into pews above the dais (as opposed to the men's choir which moved around more and was seated on the "stage" itself) the women were forced to follow the skinny maestro's fussy, angular movements much of the time. The music felt pedantic as a result and some of the edges, ragged. Olbash assembled a fine team of vocalists though. The music had me enraptured with its contorted dissonances and ethereal monophony. Plus, solo and small group passages scattered throughout the program beautifully showcased individual voices. For future concerts, the conductor should consider a) sitting out during concerts entirely or simply joining in as a singing member of the group, and b) taking a less academic approach to this repertoire in order to let the music breathe. 2. SF Chefs opening night after party at E&O Trading Co: Friday night switched gear entirely after the Euouae gig when I headed downtown with my friend to attend the opening night shindig for SF Chefs week at a spacious upscale Asian restaurant. The week-long culinary event is fast becoming a huge deal in the Bay Area's cultural life. It attracts the most happening names in the food, wine and spirits world as well as, seemingly, all the beautiful people of San Francisco. The E&O party featured delicious Asian street food (lamb lettuce wraps, spicy corn fritters, fried banana pieces, spring rolls etc) in plentiful amounts and unusual cocktails (the one I had with banana cream, vodka and curry powder was a bit of an acquired taste mind you.) Highlights of the evening for me were dancing to the cheesy 80s music provided by a DJ and listening to an absinthe maker from Paris and his partner, who's based here in the Bay Area, talk about the craftsmanship that's grown up around the culture of drinking the spirit. The two men collect absinthe-related ephemera such as old absinthe posters and special spoons and glasses that craftspeople have created to serve and advertise the beverage. They also spoke very interestingly about the hype that grew up around absinthe during the 80s and 90s when it was illegal in the US. Fascinating stuff. 3. 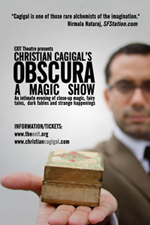 Obscura: A Magic Show at the Exit Theatre: Local magician and actor Christian Cagigal performed his macabre jewel-box of a magic show before a packed house on Saturday night, his last performance in the present run. The tiny Exit Theatre Cafe stage was transformed into a sparkling den of stories and tricks. Cagigal gracefully wove spells into a variety of quirky cautionary tales about people who got on the wrong side of the devil (or a force of nature like him) and lost. He handled his sleight of hand escapades and mind games using a variety different sets of playing cards with the punctiliousness of a fastidious and bookish widowed uncle. Though the rhythm and pace of the show became somewhat predictable at about an hour in, Cagigal managed to maintain our attention. Cagigal returns to the Exit in October. It's well worth checking out the work of this most theatrical yet understated of magicians. Finally, I am heading off to the UK for a couple of weeks starting this evening. I most likely won't be blogging while traveling. Please check in with "lies like truth" again starting on August 30.